There are two kinds of analepsis: Internal Analepsis where the story flashes back to an earlier point in the story and External Analepsis where the story flashes back further past where the story begins. The use of this device leads to anticipation or explanation or surprise for the audience. Telling a narrative from beginning to end is called Linear narrative (like a line). Flash backs and flash forwards create nonlinear narratives. That’s what we get in the horror courtroom thriller The Exorcism of Emily Rose. This spooky exorcism story is loosely based on real events and is about a normal girl who gets possessed by 6 demons after going to college (not a great plug for higher education). A priest is on trial for negligent homicide due to the fact that he asked her to stop taking medication prescribed by a medical doctor…supposedly resulting in her death. It’s an interesting story that challenges one’s religious beliefs and the summation by defense council is very thought provoking. The flash backs come into play during the trial scenes. As witnesses talk about what happens, we see them reenacted in flash back. The interesting thing is we see the same events in two flash backs and they are completely different. We see them from the priest’s perspective with all the demonic visions Emily supposed experienced…and some pretty freaky, scary stuff. Then on cross examination, We see the medical, clinical flash back to the possibilities of the same event. It’s a very clever use of flash back. It keeps the audience guessing, much as the jury listening to both sides. We’re never made comfortable enough with either side to make a choice about the priest. Flash backs are nothing new in literature (as far back as The Odyssey) to the play Six Degrees of Separation where we actually get a flash back within a flash back within a flash back! The most famous flash back film has to be Citizen Kane (1941) when a dying Charles Foster Kane says “Rosebud” at the beginning of the film and we spend the rest of the bloody film trying to figure out what that means. 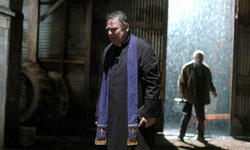 The Exorcism of Emily Rose works on many levels as a film. Its use of flash back to tell the narrative is one of its best features. What are they good for? Absolutely nothin'...oh...wait...taht's WAR!